Great communication is a valuable tool for entrepreneurs. James Schramko and Solopreneur Hour’s Michael O’Neal share what they’ve learned about how people connect. Enjoy these actionable tips for communicating better. Build stronger connections in business and in everyday life. James: James Schramko here, welcome back to SuperFastBusiness.com. Today we’re talking about communication, and for that, I’ve brought special guest Michael O’Neal from Solohour.com. Welcome, Michael. Michael: James, thanks for having me, man. I’m very honored to be here. James: Well, it’s great to catch up, and you’ve been carving a path with your own podcast. You’ve had over eight million downloads now, and you’ve been going for about three years. And I know a lot of our audience are podcasters. So if you are running a podcast, or you attend live events, say you’re coming to SuperFastBusiness Live for example, or you’re going to one of the many events that are on around multiple countries, which I highly recommend, in fact, that’s how I met Michael, then this podcast episode is going to help you enhance your communication skills. So I’m looking forward to this, Michael. Michael: Me too. I don’t know how many of your audience are podcasters, but I’m sort of a curmudgeon, I think most people are doing it wrong, so I’m excited to share some of the stuff that I’ve come up with. I’m just fresh out of going to a conference this weekend in Vegas, and while I was there, I was sort of taking mental notes about how people connect, and I’ve been on both sides of that. It depends on where you are on the ladder, but sometimes you really want to connect with an influencer, and sometimes people are connecting with you, and you’ve got to know what to do with that and how to get the most out of an event. So those are two things I’m very passionate about talking about these days. James: It’s interesting how you said the ladder as an understanding of group dynamics. I know of the first phases is the forming, and then the second stage is storming, so people come together as a group, like in that conference foyer, they’re doing the registrations and mingling around. Then they go through the storming phase, which is where people work out where they are in the pecking order. And then they go into the norming phase, where everyone knows their place. Then they go into the performing phase, where they can get the most done. But let’s talk about that ladder for a minute. James: It’s not mine, but it’s a great concept to understand if you’re building any kind of tribe. And as a podcaster, or running events, or attending events, you’re intermingling with all these different online tribes, and Facebook groups, and cliques. Where I met you as part of someone else’s tribe, so we all figure out where we are in the position. Now, let’s talk about both sides of the ladder. Firstly, on one side of the ladder, we’re completely new to the industry, we’re heading off to our first event, on a topic of interest where we see our future, we don’t know anybody, and this I can specifically relate to. When I hopped on an airplane to fly over to the United States around about nine years ago now, I didn’t know a single person at the first event that I went to over there, and it was a completely foreign country, everything was strange, even the money and the accents. So what do we do in this situation, what’s our game plan to be a better communicator at a conference? Michael: I love that, that we’re the ones that have the funny accent. When it comes to events, I love to have a game plan going in. So first and foremost, I think you should attend as many events as you can. And if you can’t afford them, un-conference them, meaning like, if you can’t afford the $2400 ticket, hang out in the lobby because that’s where a lot of, really most of the action happens anyway. You might miss out on the actual delivery of whatever the message is, but a lot of the times, it’s not like you can’t get it later on over a glass of wine, and say, “What was the big takeaway of the day?” and get some of that stuff. So try to go to as many events as you can. And the thing I like to do is to have a quote, unquote “successful event”, you really only need one or two conversations that might change your whole business or one or two takeaways. So you can’t expect to have like, your entire bucket filled because it could be just like one thing that you do that changes your whole business. So what I like to do is, I like to have an agenda. When I go to a conference, I like to say, alright, I want to really, really learn how to build my emailing list in a guerilla marketing kind of way. So whoever I connect with, that’s going to be my question to them. It’s going to be like framed around “What do you do? Are you a big list builder? What do you do for that?” And I think if you do that with enough people (and you’ll never get around more quote, unquote “influencers” than when you’re at an event), you get enough people to answer that one question, you’re going to get a really good idea of the best practices in the industry. So I like to have one or two questions that I like to have answered, and if those questions get answered, that to me is a successful event. That’s how I measure success. So that’s one thing. Two is, I like to have a plan. So if I really want to connect with James Schramko at an event, and I’ve been following all of his stuff, I like to have a plan for that. I typically will reach out ahead of time, like on Twitter or something, say, “Hi, I’m really excited to be going to SuperFastBusiness Live. I’m really excited to be there, I know you’re going to be super busy. I’m really looking forward to shaking your hand. And “I’ll be the guy in the funny hat,” or something like that. I’ll try to be somehow memorable. I did this with Pat Flynn, and my friendship and relationship with Pat Flynn, I can directly relate all of the other success I had and all of the people I’ve met to that one relationship that I really focused on. So I like to have a person or two that I know are going to be speaking and connect with them ahead of time. And then when I’m there, I try not to be a fanboy, I try not to be a pest, but I’ll walk up and say, “Hey, I’m Michael, I’m the guy that emailed you about the guy with the funny hat,” or whatever, and say, “I just want to say that your blog post on _____ (or whatever it was, whatever piece of content that most impacted you) really impacted my business, and it was amazing.” Because you tell me, James, doesn’t it feel good to have someone you’ve never met before just be like, hey, the thing you did completely changed my life or changed my business? James: I guess it’s nice to know that you’re having impact, but also someone fairly skeptical like me is cautionary around flattery. Michael: Why does that not surprise me? James: [Laughs] Well, you know, as a seasoned sales veteran, I’m quite aware of that technique, so I want to be looking to make sure that they are sincere about it. Otherwise, it could go against them. Michael: Well, I think that maybe there’s a give but not an ask. James: I’ll tell you the other thing that I dislike, and that’s when people use specific phraseology, “I’d love to pick your brain.” I hate that one because as a metaphor, it’s a terrible metaphor. You can imagine someone just like cutting open someone’s head and getting in there with a knife and fork, you know, just picking away. It seems very one-sided. Michael: The other one I don’t like is when they say, “Let me know if there’s anything I can do for you.” or, “How can I help you in your business right now?” That’s the one that really feels super cliche to me. James: I spent a whole elite retreat with him at Ryan Levesque’s event, recently. Michael: Oh, cool. Yeah. So I like Dan, and he said, you know, “When people do that, I don’t pay much attention to it.” He’s like, “I had a guy the other day that said, ‘Hey, I’ve gone through your YouTube videos, and here’s a spreadsheet, and I’ve redone all your titles in keywords for way better ranking SEO. '” Like, the guy just handed him a done thing, and he goes, “If you want, you can give me the username and password, and I’ll just do it. I’ll just do it for you.” And he was like, “Done.” And now, he can’t live without the guy. The guy is like, his super ninja video, SEO guy. James: I can totally relate to that. It’s better to do than to say. And in fact, one of my great friends and customers came to our podcast show with new logo proposals. And we rejected them. We said, “They’re good, but thanks, we’re already on track.” And he came back with a better version, and we’re like, “Hey, this is really good.” And then we ended up doing T-shirts, and website, and I referred him to everyone I know, and he just told me last night, his business has more than doubled when we started working together about two years ago. And this is from him coming to us, pre-doing the work. Not “Hey, we could do something,” or “Do you mind if I pick your brain a bit,” or what have you. So a lot of times these people will go and – take a guy like Adam Carolla, who’s a comedian here in the States. He hung around the radio station until someone said, “Dude, can you jump on air? We need a help with something.” And that was 15 years ago and millions and millions and millions of dollars ago. So it’s not unprecedented that someone who has more time than money can invest some time into putting something together. If you have talent, someone who needs your talent is going to say, “Dude, that was awesome, come work with me.” And I think that’s a really great way to approach an event. James: OK. So just a quick recap. We’re going to events. That’s first point. You got to go to an event. It’s not happening in your underpants in your mom’s basement. Two: one or two small things can make an event worthwhile. Three: have a probing question you ask multiple people to get – I call this a triangulation method, by the way, it’s like GPS. If you get three different inputs and you’re starting to pick up a pattern, you’ve probably located the coordinates. Four: reach out early, before the event, to let people know that you’ll be there. Five: differentiate. Wear a silly hat or whatever, or a tiny little waistcoat. I’m just joking. Something that lets them know that it’s you, because they’re probably seeing a lot of people. James: Six: a genuine compliment of some kind. Avoiding excessive flattery because in some markets, it’s easily detected. What have you got? Anything else? Michael: I do. So, as a dude who has spent now, whatever, 20-something years playing drums, I could go to a bar on a Friday and not know anybody, and I don’t talk to anyone. I’m like a wallflower. I could go to that same bar the next day, and my band’s playing, and even though I’m there three hours earlier, I have a whole different confidence about me. There’s something about being the guy in the band. Just like there is being the speaker, right? There’s something about being the speaker that sort of gives you this confidence, and I’d love to find the confidence bridge, and I think where that lies is in the intro. And what I mean by that is, if you’re introduced to someone, I say, “Hey, this is my buddy James,” and they don’t know you from Adam, they just go, “Hey James, what’s up?” Right? And then your psychology could sort of put you in that wallflower mode. But if I’m introducing you to someone, saying, “Hey, this is my friend James, he’s the founder of SuperFastBusiness, he’s a multiple six and seven-figure entrepreneur, has amazing podcasts, was a great sales guy for years and years and years before he got into this thing, and has an amazing group around him, and speaks all over the world,” they’re going to go, “Oh,” and all of a sudden, you’re going to feel edified, you’re going to feel confident, you’re going to feel like you can step into this. So when you go to an event, be very conscious of how you introduce people, because if you edify your friends, and you introduce them the right way, they’re going to be like, “That’s the guy.” Like, you’re going to get so much more out of your conference because they’re going to do the same for you. And you never know who you’re going to meet. I mean, honestly, it is amazing. One thing from my buddy Clay Hebert, he has this thing, you probably have a name for this as well, but he has this six-word intro. Like can you walk into this event with “I do this for this”? And his formula is, “I help _____ do _____ for _____.” Right? Or some version of that. So I can say something like, “I help other proudly unemployable people like myself take their skills and their hobbies and turn them into businesses.” Like that can be my quick little thing, to which someone’s going to go, “Well, how do you so that?” or, “What do you do?” And all of a sudden, you’re in that conversation. James: Look at you, Michael. The contrarian. Michael: What do you mean? How am I being contrarian? James: Oh, you incinerated this poor manifester. He probably wanted to manifest himself right out of there. James: Oh, that’s it. I want to be deliberately vague and mysterious. Michael: Right. Because the idea is to get into the conversation. That’s the point of this. James: Well, the whole point is, I’ve just differentiated myself from every marketer who’s running around trying to pitch people. James: Well, it’s kind of a joke on Game of Thrones, but you may not watch that. Michael: I do. I watch every episode. I don’t get it. Michael: Oh. That’s funny. Yeah, right. But I think the point is if you’re a bit shy, and you’re a wallflower, that it’s nice to have a good setup with an introduction. Ideally, someone else introducing you is way easier than having to introduce yourself because you’re getting the power of positioning, and that’s what’s different about when you have VIP Speaker on your name tag. Convention has positioned you as an expert, or an author, or someone worth listening to by the very fact that you’ve got a little bit of colored ribbon on your tag and the special words. And it’s absolutely true. I know what you’re talking about, whether you’re in the rock band or in the audience, and it could be the flick of a switch. You are either the rock star or the concert goer, and you can certainly pull levers to make sure that you’re positioned more as the rock star than the attendee if you want to. And that’s sort of an advanced strategy. I’m looking forward to one day talking about how I managed to get myself on stage at events like Traffic and Conversions, and Mindvalley events for Zentrepreneur, and also Underground event without actually being booked to speak. And I’ve usually managed to do it the night before. So there’s specific and deliberate actions you can take to propel yourself into the limelight if that’s what you desire, and that might not be the one or two small things you want from an event. But I can vouch for the fact that if you can take a premium position at an event, it will have a big payoff for you in terms of the contacts you get and the market stock value of your brand and reputation. Michael: I agree. In fact, on my list here, I said, “VIP if you can.” Like, if you can afford it, do the VIP, because it will bring you into a different level of people, and I was going to mention before, it’s OK to ask a buddy to give you the intro. I just did that at a table the other day. I wanted to meet a guy, I was sitting right across from him, I could have just been like, “Hi, I’m Michael O’Neal, but then I said, “Hey, dude, would you introduce me?” And then I got the setup. I got the introduce, “Hey, this guy, he’s got a podcast, he does blah blah.” And again, with the setup, it changes the whole dynamic of the conversation. So if you can pair up, I mean that’s even something you could do on day one. If you do meet some folks and maybe have an awkward first conversation, say, “Hey look, do you want to like double down on our networking here? If so, let’s introduce each other, and here’s how you can introduce me, and vice-versa.” And then you can sort of team up on it. It’s always better to get an intro, no matter what, even if you’re, like if you have a podcast guest you want to get, or whatever, I’ll always look at a friend’s podcast and go, “Oh, would you mind sending me an email intro to James Schramko,” or something like that. James: That’s a very good technique because you could reasonably assume, if someone’s appeared on a podcast, then the podcaster knows them. For example, if someone wanted to meet you, and they listened to this podcast, they know that I know you. I must have your email address or be friends on Facebook, enough to the point where we could arrange something like this. So it would be easy for them if they’re well-known to me to ask me for an intro to Michael. James: It’d be far warmer, an email introduction coming from me, than a cold tweet. Michael: Right. Or a “Hey, my name is blah, blah, blah, and…” you know. But the one thing I will say to do and not to do is, if you do want to like pitch a friend of your to a podcast or something like that, don’t just ambush the podcaster with like, “Hey, you should have my friend James on your show.” And you’ve copied you and James on the email, because if that person’s like, “You know what, I’m not so into this, I don’t want to do that,” then we’re in this very awkward position where we have to say “No” to this person that you’ve sort of place right in front of him. You know what I’m talking about? James: So if I do say “No”, then the person quickly learns not to set me up because they might be disappointed. Michael: Right, well if you don’t want the lesson being taught, the way to go is to reach out to the podcaster first and say, “Hey, I’d like to introduce you to this person who does this, this, this. Is that OK?” And then yeah, “Yes” or “No”. It’s one of those deals. It’s just common courtesy. James: Yeah. And I usually, I’ll try and avoid pre-confirming an arrangement that I haven’t got permission to make. I’ll generally make a soft introduction and leave it up to them. James: Like in my case, I connected you to someone recently, a friend of mine dear to me who’s very successful, who’s got a fair bit of demand on his time. And my introduction would be more along the lines of, “Hey, such-and-such, meet Michael, you two should have a chat, I think you’d have a great conversation.” And I’d leave it at that, and that’s up to you guys then, I’ve done my bit. But he knows I wouldn’t even introduce someone who I didn’t think was worth having a conversation with because that would be stupid. I’m not trying to point score or gain anything from it. I’ve got no other motivation than to connect people who probably should be friends that Facebook hasn’t figured out yet. Michael: Right. Yeah, I totally agree. So just a couple more, can I give you just a couple more, like event tips? And if you want? James: Yeah. We got space for eight and nine. Michael: Be responsible, but not too responsible. Like, the parties are where the magic happens. People like to get away when they get out, and not everybody wants to talk about business and funnels and stuff the whole time. So it’s cool to go have a drink, maybe don’t go nuts until four in the morning and then miss the first three quarters of the next day, but a lot of stuff happens at the bar. There’s a lot of business that gets done there. James: Hundred percent true. Hundred percent true. Michael: While you’re there at that bar, this is another very subtle but important thing to know how to do, is if you’re sitting at the bar, and you’re in a bar chair and someone’s on your right, and someone’s on your left, back up two feet, so you bring yourselves into a triangle, instead of turning your back on one or the other. You want to be as inclusive as you can with conversation. You’ve got to notice if there’s someone who might be a little more nervous than you and a little more solo and a little more shy, who’s sort of hovering around the outside of a conversation. Just turn to them, and open your body language to them so they feel included. And you can even say, “Hey, I’m Michael, how are you doing?” It’d be weird if you did that and your name wasn’t Michael, but you can try it anyway. But you can say, “Hey, I’m Michael, and what’s your name?” and that kind of thing. Even if you’re having this like, conversation, you’re at a conference, you’re out in public, you can’t fully expect privacy the whole time. Sometimes you’ve got to just take what you get and say, “Let’s finish our conversation later around the corner,” or something like that. But just be inclusive. That’s sort of my last, while-you’re-at-the-event kind of tip. And then after, the fortune’s in the follow-up. So if you talked to someone, you got their email address, make sure you write them, and then if there’s some sort of Facebook group, a lot of events now have Facebook groups, get in there and participate. Like, be active. You’ll be amazed at how quickly the next year’s conference comes up, and if you were sort of active in that Facebook group and connecting with people, you’re going to walk in feeling like big man, big woman on campus, because you’re going to know everybody, you’re going to know what their businesses are, and you might just get that VIP badge without having to buy it, which is always a good thing. James: Good tip. So be responsible. Definitely the action happens at the bar. That’s how I’ve made great introductions to people who have turned into good friends, contacts, clients, speaking opportunities. I also would add another tip, be interested rather than trying to be interesting. Some people try a bit too hard to be interesting. It’s very rare; actually, people these days would listen and actually care about someone else. I’ve found that to be a great networking tip, is actually forget about yourself for a minute, and focus on the other person for a while. You know, ask some questions, be interested in what they’re talking about, and follow that natural curiosity, and they will appreciate that you took time. It’s How to Win Friends and Influence People. That was the dinner party trick, and it works. Also, with regards to exchanging details, I’m not sure what your stance is on business cards, but I don’t take business cards to an event. I don’t deal with business cards, to some extent, not really my market. But what I will tend to do is I’ll just send them an email from my phone right then and there. I might just say, “Michael, just tell me your email address, I’ll send you an email reminder.” And I’ll just send them an email saying, “If you got my details now, ask me about such-and-such.” I’ll usually be offering something, some advice or some tip I’ll be able to point them to a podcast, a checklist, a resource, introduce them to someone. It’s very rare that I would find someone that I couldn’t add value for them because of the market that I’m in now. Michael: Right. I agree. You’re so right about the interested versus interesting. It’s something I try to focus on as well on the show that I do, and just… sometimes you feel like they’re just waiting to give their pitch. You, you, you, me, me, me, you know? It’s the whole Brian Regan thing he talks about. I love that. I love the interested versus interesting, it’s a great way to frame that. James: [Laughs] Well, the thing is, you don’t have to please me. It doesn’t matter what my opinion is. Look, we used acronyms when we were in the motor vehicle sales environment. We had an acronym called SPACED. And most people, when they came to visit the car dealership were interested in a motor vehicle, amazing, I know. And it was our job to survey them and find out what they were most interested in. This is all about relevancy and context, and these days, online you hear about it called the Ask method, for example. It’s about only having the conversation around things that people are comfortable having it around or being interested in. SPACE was Safety, Performance, Appearance, Comfort, Economy, Durability. Usually one of those things will be more important to someone. And then we throw out the rest. So FORM, I have heard that before. I think it is a great framework if you are starting out, and you are uncomfortable in a crowd, it’s fantastic to have a tool like that to lean on because conversation can very quickly run out if you don’t have a framework. Usually, it will be something like, “Gosh, it’s cold today,” or “Gee, it’s hot today.” “How’s the weather?” Then you’re done, you’re out. Michael: Right. And there we go. You know, what’s crazy is that, so I had for like a year and a half, I had my show going, and you know, my show’s an hour. So I literally hit record, and then I hit stop, and there’s an hour in between, I don’t do any editing in the show. So it’s on me to carry a conversation for an hour, basically. And I’m good at it. It’s what I do. It’s my thing. It’s my sweet spot. And it was great. And so I remember being at this bar in San Diego, and I went there with a friend of mine, and we’re hanging out, and she brought a friend of hers. So my friend went to the restroom, and I’m sitting there with this girl I didn’t know, with nothing but awful, awkward silence or bad conversation. Like, those are the two things that are happening. And for some reason, I said, wait a second, what am I doing? I regularly, multiple times a week, have conversations with strangers that are entertaining, and deep dive, and interesting, and I have no problem with it. Why do I have a hard time just sitting at this bar? So I mentally flipped the microphone on, in my brain, and we had this fantastic conversation. And it was like, oh, is that what it is? And ever since then, I’m much better in real life situations. I don’t know what the issue was, but I just couldn’t put together, I think maybe it was that interested versus interesting thing. I think we sort of judge people so quickly, whether we need them or not, especially at an event, whether they can help us or not versus just trying to get to know them. James: That’s exactly the point, Michael. That’s exactly what I was talking about before, where people are lining you up with their elevator pitch, false flattery; they’re waiting for where they can leap in. They want you to ask them what they do, so they can impress you and they can shoot up the ladder in the storming phase. I’m aware of all of these things, so I’m super conscious of it. I’m filtering on a hundred layers when I’m having a conversation with someone for the first time because I know that’s what’s in their mind, but they probably don’t even realize they’re doing it because it’s a human trait. Selfishness is something that we’re all blessed with, it’s how we survive. Our goal is to propagate our DNA and survive, right? 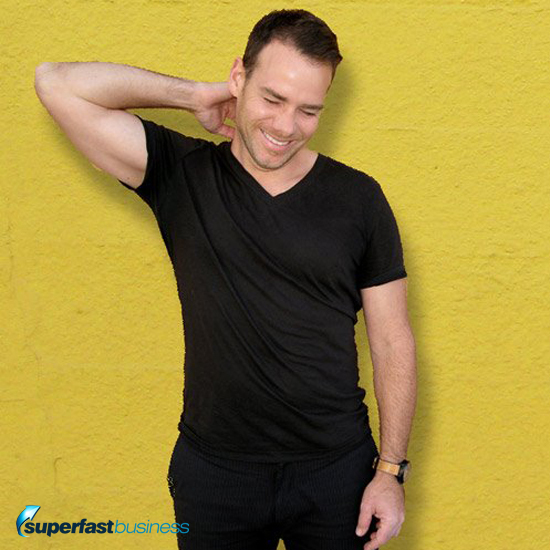 It’s like, I’m sure you want to find out from me how to grow a seven or eight-figure subscription business; however, right now, I’m here because I got my one or two small things that I’m looking for. So it creates this unusual situation. So that’s why, in my case, when I’m going to some of these events, and I have that valuable time invested in the event, there might be things on my requirements as well. So when all these other people are looking to get their thing from me, I also have to guard that a little bit as well. We didn’t talk much about the other side of the ladder but when you get a little bit of celebrity or positioning, then you have other issues. To the point where at some events, or if it’s your event in particular, you’ll definitely need to have a caretaker to just create a little bit of space around you so that you can get into the room and out of the room and things like that from time to time. Michael: It is hard to cross the room sometimes. James: But you also want to create a framework where you have big breaks, lots of time to meet every single person so these things factor in. I’ll also throw out one other slightly contrarian point of view regarding the one or two small things or the pre-event plan. I think it’s also good to be open-minded to utilizing whatever comes up at the event that you hadn’t anticipated, which is a real key to how I ended up getting speaking gigs. I’m literally on the stage the next morning, nine in the morning, with a presentation I’d built overnight because I convinced the event owner that I should be taking his spot first thing in the morning. And after enough alcohol, he thought that was a fantastic idea! Michael: I think I can hear you saying, “I think you should let me speak tomorrow at ten,” while you’re out with him or something. Michael: I want to hear that. I want to have that privately with you. I like it. 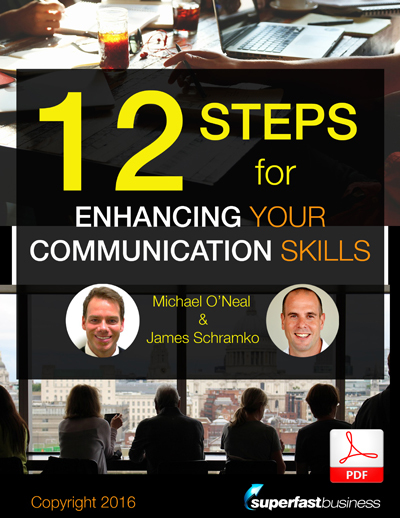 James: What I think we’ll do now is we’ll just recap our 12 steps that we’ve created here for enhancing your communication skills whether you’re podcasting or going to events. These ideas will help you to get your message across, or to approach it in a new way perhaps if you’re shy, or if you are getting too much attention. It can help you understand what people are doing so that you can be aware of it. Are you ready? James: Okay. Firstly, go to events. Secondly, one or two small things will make an event worthwhile, so if you’ve got a challenge or a situation that you’re finding is holding you back in your business; go to the event with that filter. Third, have your probing question and ask multiple people so that you stand to gather more intel. You’re doing your research on the fly. Fourth, reach out early to people who you know you want to connect with. Five, differentiate yourself. You don’t have to be too wacky but just, it could be the Australian accent. In your case, that’s not going to work, but it could be that you’re a Porsche lover and you have a Porsche t-shirt on, for example, or Porscha. Six, genuine compliment. Avoid false flattery. People like me are totally aware of that. Seven, get the best positioning you can either through being a speaker, or having someone else introduce you, or somehow getting someone to be fairly quickly aware of where you are in terms of the ladder or the storming phase. Eight, be responsible but go to the bar. It’s all happening around the event, that’s where the socializing is happening. That’s why people go to events and not watch the livestream because they want to meet other people, and they want to fast-track their relationships. Nine, be interested; not focusing so much on being interesting. Ten, exchange details as early as possible because once you leave the event, it’s much harder. It could be the Facebook group, it could be an email, it could be a card. Eleven, follow up. What’s the point of making contacts if you don’t do follow up? Here we are, year in a bit after we met, Michael. We’ve done a couple of podcasts. We chat. We meet each other at events. Twelve is use a framework to make it a bit easier on yourself to have a conversation. The framework that Michael suggested was FORM, which Michael stands for? Michael: Family. Occupation. Recreation. Motivation. Michael: Four things that people love to talk about. Michael: Did you say to have your intro ready? Your six-word intro or whatever. Your short, sweet answer to what you do. Did you say that? James: Yeah, we talked about positioning and having someone intro you, so I guess you could jam that in there. You can tell someone what your intro might be, either you’re doing it, or someone’s doing it for you. It comes in the positioning. So that’s it, Michael O’Neal, Solohour.com. We’ve been talking about communication. You’ve got more stuff on your website about this, haven’t you? Michael: I do, yeah. I’ve got a whole course called the Art of the Interview, which is aimed at podcasters if they really want to be better at podcasting, and getting really great interviews, and then getting big influencers to actually share the show, which most of them don’t anymore. They pretty much only do when you nail it. And then I also have a giveaway, a free giveaway, called How to have a Better Conference. It depends on when you’re listening to this, it may or may not be ready by the time you listen to it, but that’s in the works. So jump on my mailing list, and you will see that come through your mailbox. James: Great! Well Michael, I’m looking forward to catching up with you at the next conference I attend, which will be in your hometown. Michael: I’m very excited about that, Mr. Schramko. I can’t wait to see you! James: Well, thanks for spending some time with us. This is a great interview. Nice one guys! Thanks Garry! 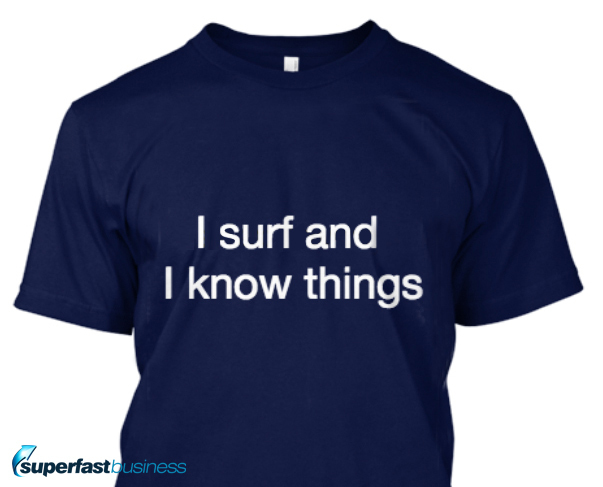 Spooky too – I was thinking about you today when I was in the surf and here you are!